In the real estate sector, a lot of paperwork and documentation is involved. Every action is put down on paper and the parties involved are made to sign on it as authority. 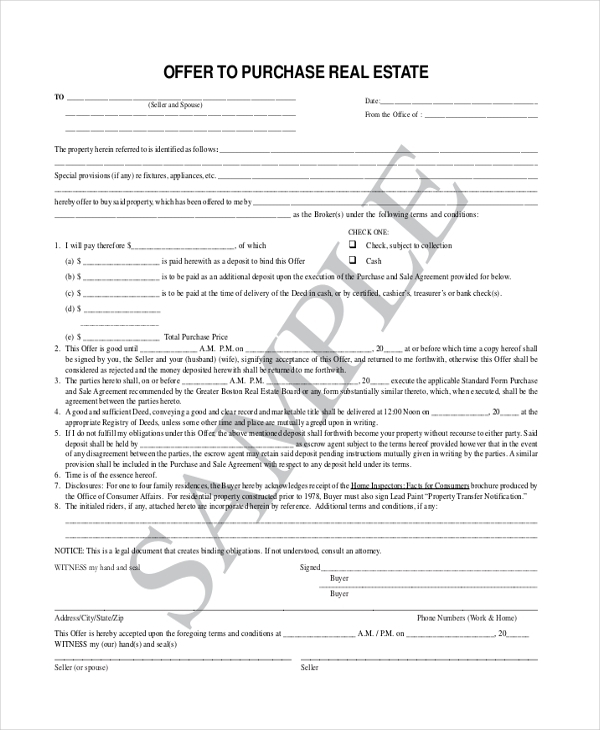 One of the most popular types of paperwork in real estate is an offer to purchase real estate form. It is essentially a contract between the seller and buyer of real estate property. For any other kind of real estate conveyance, this type of Real Estate Forms can be used. A sample offer to purchase real estate form is usually useful for scenarios where residential real estate is involved. The paperwork is a bilateral agreement between the parties involved in the buy, sale or exchange of the property in question. It is a legally-binding consideration in written form. 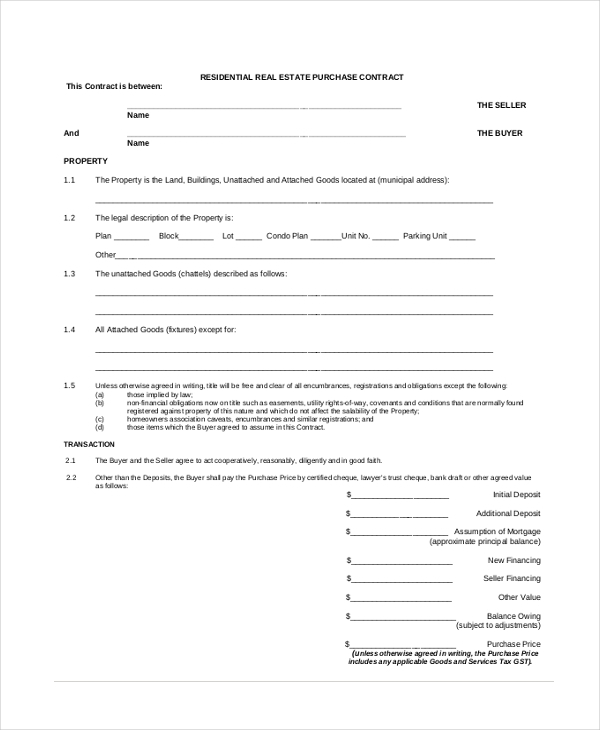 A standard offer to purchase real estate form usually contains fields wherein the identity of the parties is to be specified. The essential details, rights, and obligations need to be listed next. This is followed by the terms and conditions or contingencies which must be fulfilled for the agreement to be executed. Lastly, the amount of deposit and closing costs, and signatures of the parties should be there. An offer to intent to purchase real estate form is another avatar of the same kind. The specifics which need to be populated include the names of the individuals/parties, terms, and conditions of the sale/purchase/buyout. Property costs agreed upon, the amount deposited, balance amount, date of contract and signature of the parties involved in the contract. If you’re looking to customize and recreate an offer to purchase real estate form, good news is that it is possible. On the Internet, there is an abundance of samples which are readymade, blank and can be tweaked by users. Just download your preferred blank sample and make the edits in MS Word, include fields and guidelines of your choice. When a buyer sets out to buy a home, real estate paperwork of all kinds is an absolute must. After the negotiations are completed and a decision to sell and buy (respectively) is taken, one of the first documents which need to be filled accurately is an offer to a residential estate purchase form. All kinds of details need to be populated accurately so that the purchase contract can be executed in a proper manner. 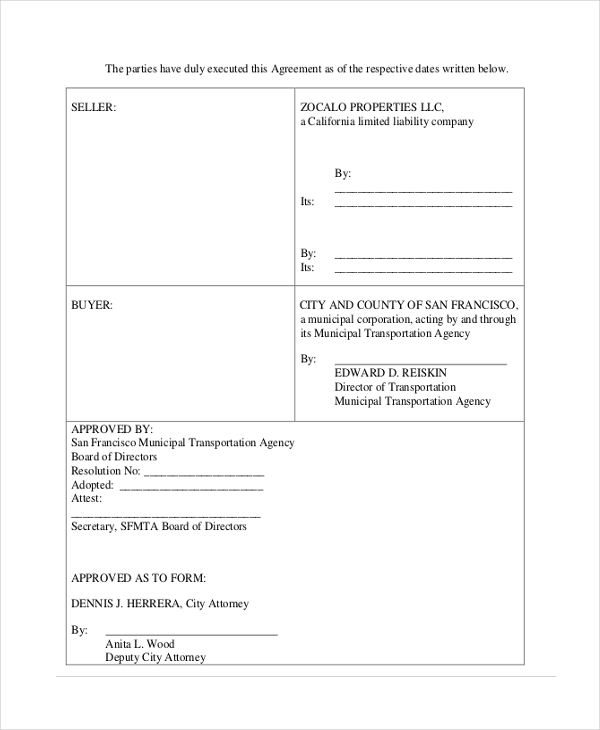 It is mandatory that an offer to purchase form be understood very well. The finance terms need to be indicated and explained in detail. The amount agreed upon and the timeline of the transaction need to be established in the contract form so that there are no mishaps in the course of the execution of the agreement. Also the contract contingencies. There are several factors which need to be duly considered and played out when a purchase form is getting defined by the parties – buyer and seller – involved in the real estate transaction. In order for the purchase to be accomplished in a smooth manner that the contract has a mention of all the rules and regulations of the purchase, important dates, monetary information, etc. 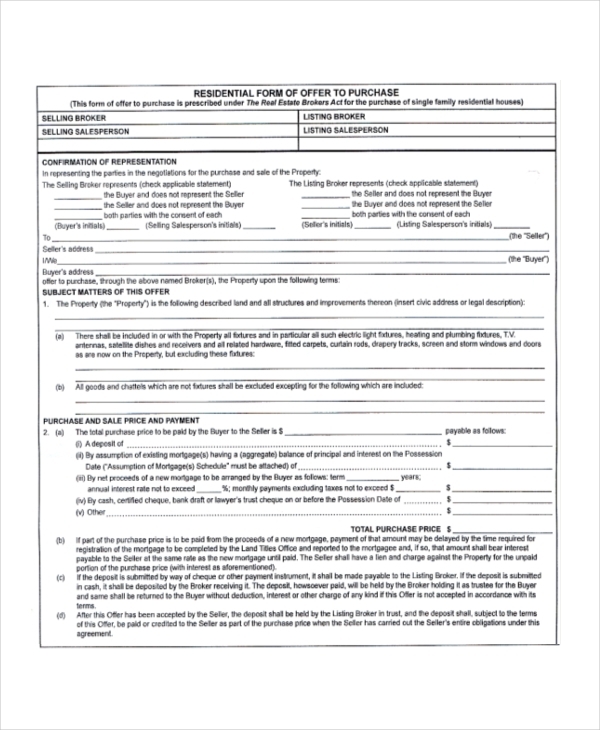 Buying and selling parties interested in the sale and purchase of a real estate property are usually the target audience for Offer to Purchase Real Estate Forms. 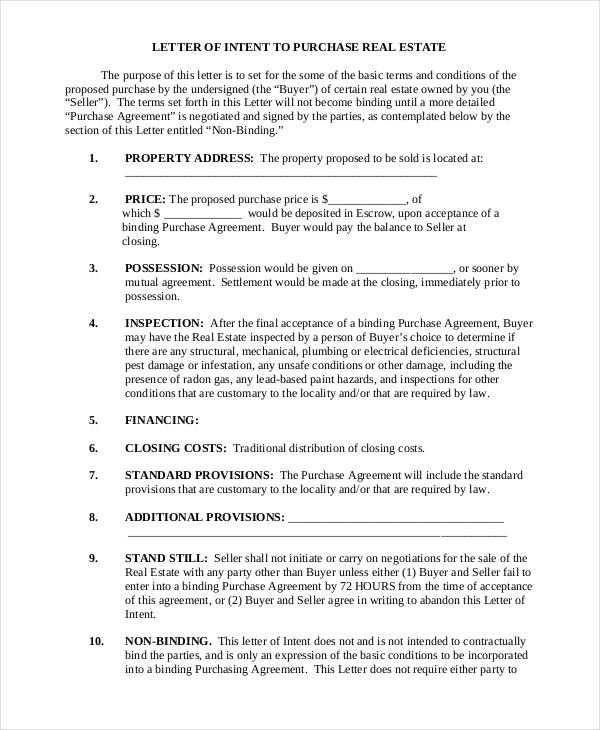 The forms are contracts and legally-binding documents which are used as actionable materials to specify the terms and conditions of a real estate purchase. It is compulsory that an Offer to Purchase Real Estate Form is to be used if and when a scenario of real estate purchase emerges. You may also see Real Estate Offer Forms. The primary use of Offer to Purchase Real Estate Form is that it is used as a material to show that the sale and purchase of a particular real estate property have been finalized between the parties involved and the process is underway. All the points, guidelines and contingencies have been duly discussed and agreed upon, after which the same has been drafted onto the purchase contract and undersigned by the parties participating in the sale and purchase venture. Where Can You Get Offer to Purchase Real Estate Form? 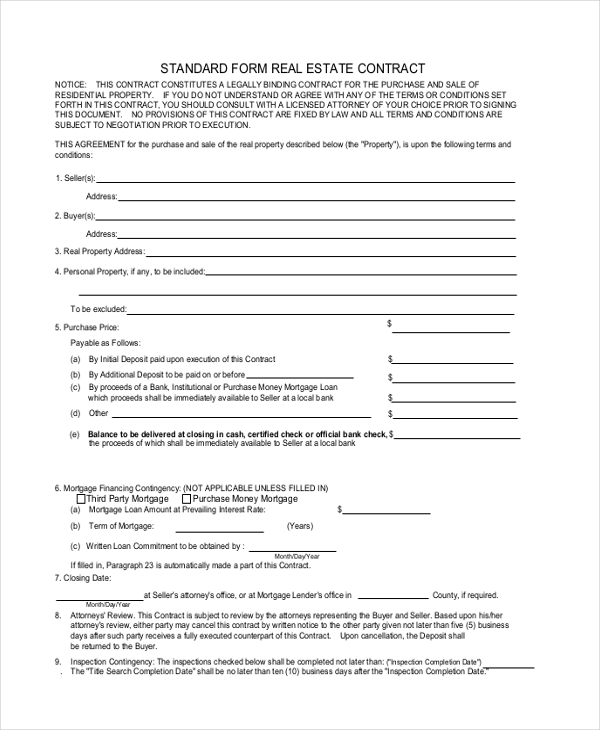 As mentioned earlier, Offer to Purchase Real Estate Forms is an important element of real estate dealings. These documents ensure that every point discussed prior to the transaction is laid down on paper and executed in a professional manner. 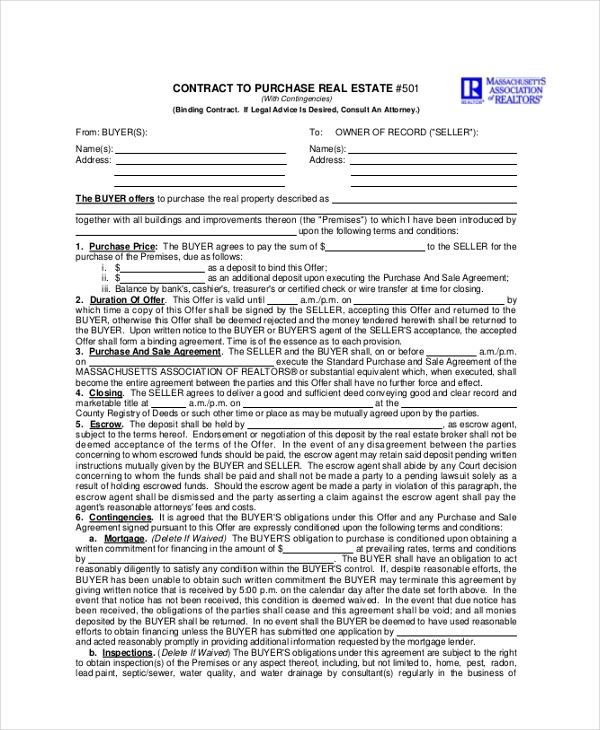 Offer to Purchase Real Estate Forms makes it easy for buyers and sellers to be on the same page regarding the purchase of a real estate property.